Dodge kept their word and they made it happen. 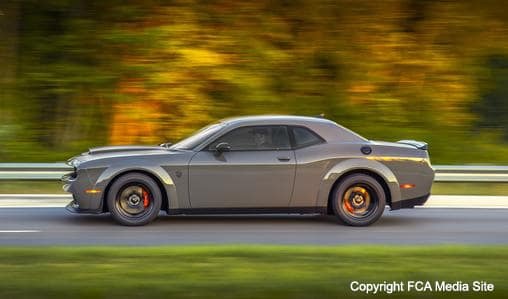 Dodge and SRT paired up and made a factory-produced muscle car that is more powerful than the SRT Hellcat, which was the most powerful factory produced muscle car in the world. In fact, the Challenger SRT Demon currently produces more horsepower than any other V8 engine and this helps to make it the fastest 0-60 mph production car ever produced. The 2018 Challenger SRT Demon produces 840 horsepower and 770 lb-ft of torque, whereas the SRT Hellcat produces 707 horsepower and 650 lb-ft of torque. The Challenger SRT Hellcat accelerates from 0-60 mph in 3.6 seconds, which is almost “slow” compared to the Challenger SRT Demon’s 0-60 mph acceleration time of 2.9 seconds. The Challenger SRT Demon does a quarter-mile in 9.65 seconds and the Challenger SRT Hellcat does a quarter-mile in 11.7 seconds. The Dodge Challenger SRT Demon is powered by a supercharged 6.2-liter HEMI SRT Demon V8 engine. Though that engine might sound similar to the SRT Hellcat engine, it is actually quite a bit more powerful and fairly different. The supercharger on the SRT Demon engine is 2.7 liters, which makes it .3 liters bigger than the SRT Hellcat’s 2.4-liter supercharger. If you know cars, feeding an engine with as much cold air as possible is the key to creating power, so Dodge and SRT got extreme with engine cooling on the Challenger SRT Demon. Those cooling characteristics not only help the SRT Demon excel, but they are also many industry “firsts.” These characteristics include: Air-Grabber induction system, which includes the largest functional hood scoop (45.2 square inches) of any production car; first-ever factory-production car with innovative SRT Power Chiller liquid-to-air intercooler chiller system; and the first factory-production car with After-Run Chiller that keeps cooling the supercharger/charge air cooler after the engine is shut off. Dodge and SRT didn’t just focus on the engine to make the Challenger SRT Demon a true speed demon. Engineers did a lot of reworking to the standard Challenger to optimize the engine’s potential. One of the biggest changes Dodge made to the Challenger SRT Demon, was the removal of all seats except for the driver’s seat and by doing so, the car weighs about 100 pounds less than it originally did. To further lighten the vehicle, Dodge removed many of the speakers from the 16-speaker system, removed trunk coverings, carpet and spare tire and they also took out a few other things. However, buyers can purchase an additional passenger seat for $1. Unlike the other Challenger models, the Dodge Challenger SRT Demon is a widebody Challenger and it has very wide rear tires to help it better grip the track. To bring the Demon back from the 1970s, Dodge revamped the original Demon logo to look a bit more modern. So far, all we know about production is that Dodge plans on making about 3,000 models and we’ve heard rumors the models will start around $85,000, but that hasn’t been confirmed by FCA — we’ll definitely keep you posted. In the meantime, check out University Dodge’s available Dodge Challenger inventory. Sure, the SRT Hellcat doesn’t produce 840 horsepower, but its 707 horsepower is the second most horsepower any production engine produces.